This year, when it came to covers, it wasn't even close. Ladies and gents - DAREDEVIL: BLACK AND WHITE #1. While Marvel's Savage Magazine format is something anyone should, could and would hope to see a whole lot more of, this classic pulp inspired number almost negates the need for pages. Don't you miss decent cover captions? Drawn by artist David Aja, who re-wrote the book on the covers of The Immortal Iron Fist, the message has never been stronger. 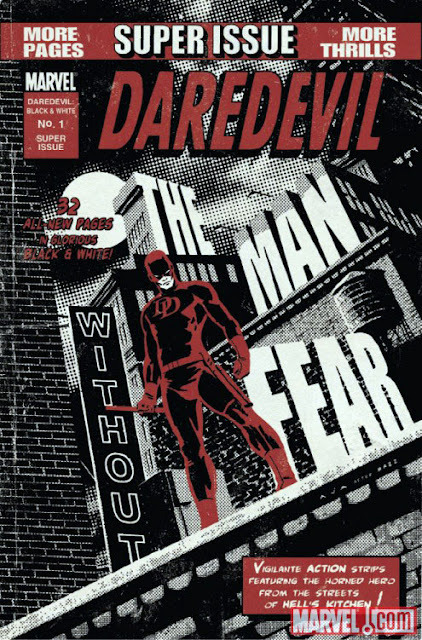 Daredevil may be 'The Man Without Fear', but cross the line in Hell's Kitchen, and he'll put the fear into you. More David Aja? Click the jump. It is simply beautiful. And completely frame-worthy. The kind of thing you keep in a bag and someday put on a wall above the computer for your grand-kids to stare at in awe and think "My Grandma must be the coolest one in the entire universe." Thanks guys - glad you like the pick - I've been staring at it all year (it's my wallpaper at home) so I wasn't sure if it was just Marvel's subliminal advertising paying off! You're right IFF David Aja is a highly unsung power source of great images! Cool pick Dan. I actually bought this issue based on that cover, so I can see why it won! I ended up picking DC's Superboy #1as my favorite of the year. Nice choice Kello - that was an awesome shot too! Just a simple strong Superboy and a bold yellow background.